So far it looks like it will win? I searched youtube for good C++ tutorials.But I couldn’t find them upto the mark.If you could start some,it’l be really appreciated. Its coming when Android is done. You’re doing an awesome job. I’ll keep watching to your posts. Happy new year!!! I am so touched with this post. Thank you Derek and other people there who are making tutorials for free. 2 thumbs up for you Derek! J2ee for sure,Please include design pattern in it too so , we have a complete idea how it works to write good code. Please include in J2EE frameworks like Struts, Spring, EJBs please. Are you planing to include JSP also?. Really enjoy your website .. keep it up for as long as you can. u covered most of the languages … why not c++ ? and thanks a ton for the other free tutorials !! Android development please .I wish to finish of the Java tutorials (currently on 15th) and get on Android,and I don’t think there is any other place to learn better than your videos. Thank you for the compliment 🙂 Here is my Android Video Tutorial. I’m working on more right now. start j2ee.. I need that. Derek Banas you are awesome dude. Thank you 🙂 I plan to cover J2EE while I continue covering Android. J2EE at this time. Thanks! I plan on either covering J2EE or C++ next while I continue with Android. I’ll put it up for a vote. Amazing work …. no words to express your dedication for the free service. Really helpful & one of the fines ones available over youtube tutorials …. I personally was looking for J2EE with Frameworks Like: JPA/Hibernate – Spring …. all in depth …. Few months back I contacted you through youtube and requested for webservices …. I hope you remember…. Since than I have been following your work deeply. Thank you for the nice compliments 🙂 I have been pulled off track. I will do my best to cover J2EE topics as soon as possible. The Samsung tutorials end this month so I’ll be moving in a new direction soon. 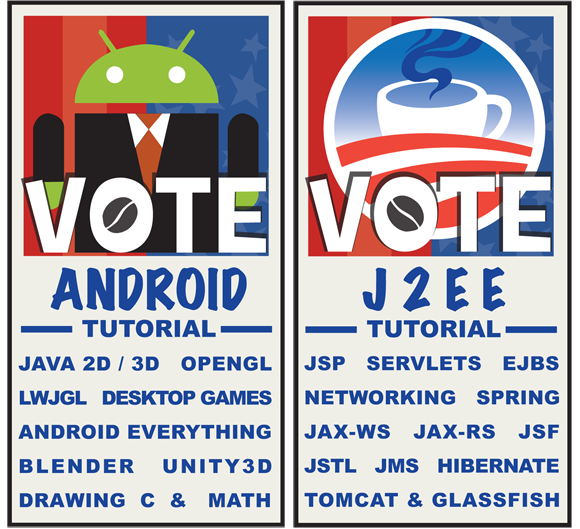 I vote for J2EE. thanks Derek for the others. I vote Android. By the way I like the Android’s suit and tie. That’s funny 🙂 You got your wish. I have over 40 Android tutorials so far and I’m going to make many more. Hi Derek, you are doing an awesome job. Thank you very much. Thank you 🙂 Many more Android tutorials are coming very soon. I hope Java EE will have more effort. 1. Android has been explained with acceptable extend. 2. Java EE is little complex topic and needs somebody who is really talented to work on it. When I cover Java enterprise I promise to cover it in detail. Sorry it is taking so long, but Android has taken way more videos then I expected. I believe in you and I’m sure that you will be the best one who will explain Java EE topic. Thank you for everything you made. You’re very welcome 🙂 Like always I will do my best. I have over 40 videos so far. Here are a bunch of them Android development video tutorial. I hope you find them useful. maybe hibernate & spring frameworks? Both topics are on the list. Sorry it is taking so long. please start j2ee spring and hibernate tutorial. I’ll cover them as soon as possible. Please start j2ee, JSF tutorial! You’re very welcome 🙂 I’ll cover enterprise as soon as possible. I cover how I make Youtube videos in this tutorial. I vote for J2EE. But just make sure you site wont crash after that. I am sure you are going to attract a lot of people. It’s a pleasure to go through all of your tutorials.I have been waiting for Jee for long.I wish, you could beat all Jee tutorials on web ! !.When are those coming ? May God bless you !!…. Blender and unity tutorials please! And whatever else is involved into making games….! Android games are starting very soon. I’m working on them right now.